Discussion in 'The Workbench' started by johnfv, Jan 24, 2019. I'm a novice with mods, am making some tone tweaks to my TW Express clone - trying to tame the gain/clipping and brightness a bit. I've already made good progress by tweaking various resistor values. I want to try adding a Vox style cut control, my question for the amp build experts is this: how important is the location of a cut pot for minimizing noise? Can I put it on the back panel or is that asking for trouble? Experienced advice/suggestions appreciated. My amp is a Ceriatone, here is the layout. I intend to keep the presence as is (and mine has a PPIMV on the front panel next to presence). There is plenty of space on the back panel away from the output section. What schematic are you using for treble cut? 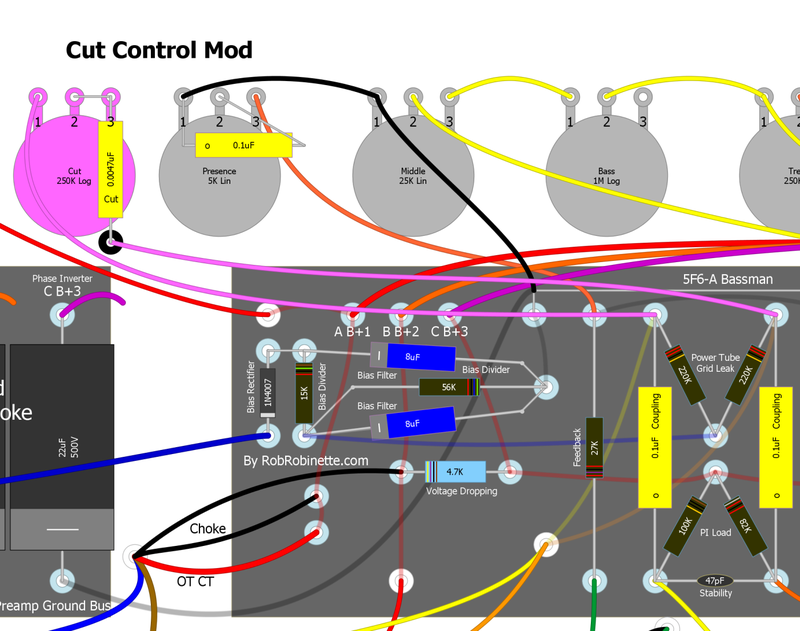 That "Cut Control" in pink is a PPIMV circuit. So are you going to have two PPIMV controls? The Rob Robinette Cut doesn't appear to use a dual pot (nor does Kens pages showing a cut diagram). I think there is confusion of "Cut" versus "Master" in this discussion. Use a piece of 2 conductor shielded cable, locate the pot where it is best utilized. Only ground the shield at one end. Isolate the shield on the other end of the cable. ValveStorm sells 2c with shield cable. John, If you wish to keep your PPIMV and add a "Cut control" then scroll all the way down to the bottom of Rob's page, click on the Trainwreck link. There is a diagram there, again way down in those pages, of a cut... plus a type 3 master PPIMV. See if that is what you may have in mind. Thanks for all the info Terry. It does currently have a dual pot PPIMV, I was thinking I could also do the cut? I realize they both go to the same location, I was hoping that it could work with both. Maybe I would need to do it more like this (Nik's DZ30)? I'm no expert but I thought the capacitor is what makes it a cut? Look at the vox ac30 schematic. It's just after the p.i. I'd say go the DZ route. Yes it is a PPIMV type circuit with a adjustable frequency shelf cutoff due to the incorporated capacitor. It cuts frequency starting from the upper range. Lower capacitor values will not cut as deep. Great deal that it worked out so well, kudos. I finally got the amp put back together today - I had ordered a Classictone choke and it took some time for Triode to ship to me. Overall I'm very happy with the results. I tried a number of different mods and now the gain and tone of the amp is much more useful to me. Before it really was a humbucker only amp and had a lot of distortion/gain. Now it is much more Fender friendly and I have a more headroom available. In addition to the Cut on the back panel, I tweaked a few resistor and capacitor values; I also added the choke. I played around with choke location to see if it made a noise difference (it didn't) so I put it where it was easiest. Here are a couple of pics, my mods are pretty obvious - I did them piggyback style where possible (and the mediocre solder skills show ). I tweaked the bias a bit and now it really sounds great! Guitar-Rocker and MarshallDog like this. Just out of curiosity, what brand of EL34's are you using in it? It has the Mullard RI tubes in there, they're pretty good. I think the TADs are still my favorite for EL34. EH is not bad either.